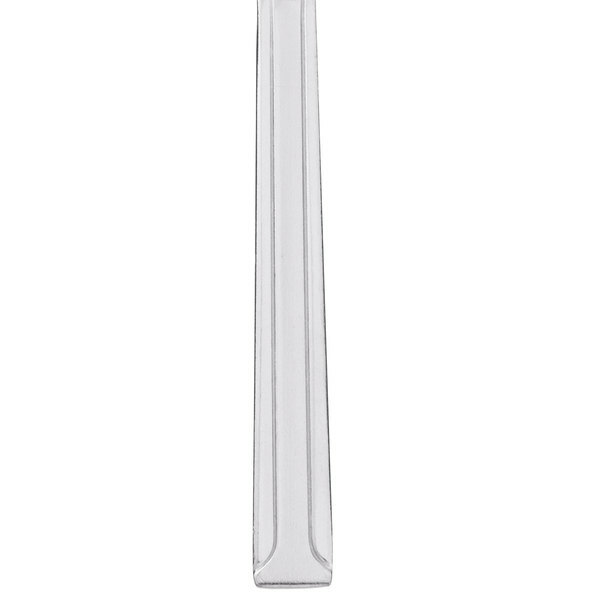 Give your guests functional flatware with the Choice Dominion 8 3/8" 18/0 stainless steel medium weight dinner knife. Complete your table setting with this Choice Dominion 8 3/8" dinner knife. Pair it with the rest of the Dominion line to create an simple yet attractive table setting. Your guests are sure to appreciate the tasteful design of this flatware, and it won't break your budget! Made of stainless steel, it will be a long lasting and complementary addition to your decor. 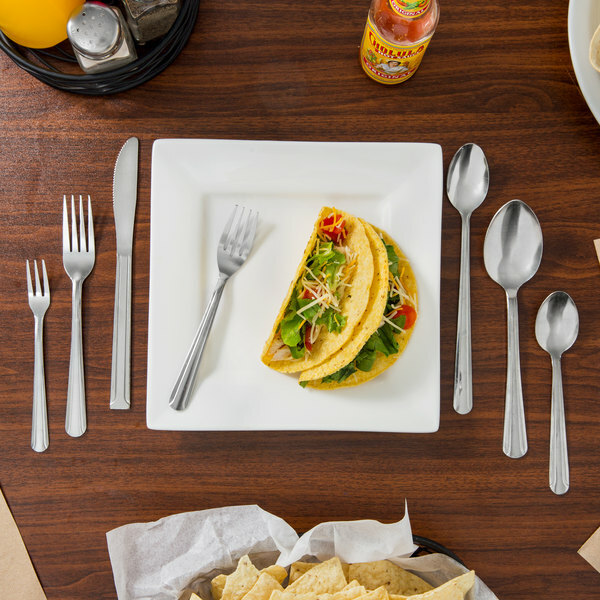 Ideal for diners, cafes, and bars, this flatware adds the perfect touch to your casual eatery! "We purchased these for a wedding reception on our farm. They were actually cheaper to purchase the silverware from Webstaurant than it was to rent them for the reception. Awesome Price!" 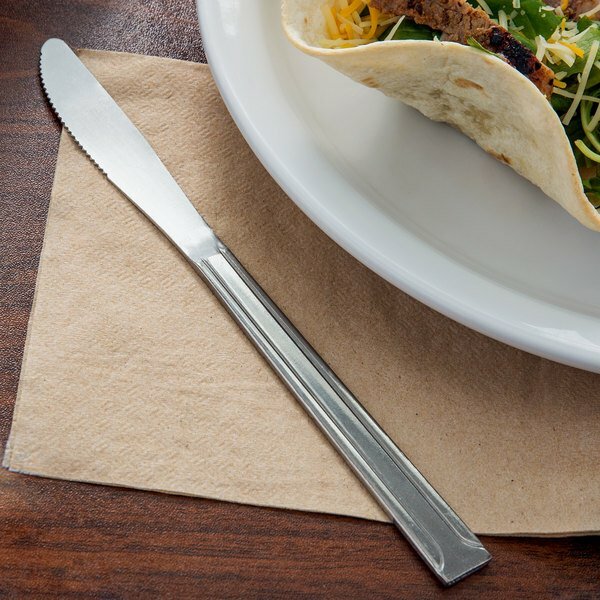 This dinner knife boasts a classic design with a smooth panel and rounded handle, and thanks to its subtlety it won't feel out of place in a casual dining atmosphere. Its satin finish offers a professional appearance, yet doesn't take the focus away from your perfectly-plated culinary creations. Boasting an 18/0 stainless steel construction, this sleek flatware is best used in a casual and warm dining area. 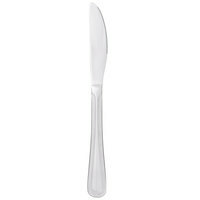 Serve this dinner knife with your vegetable entrees to provide guests with an unforgettable dining experience. 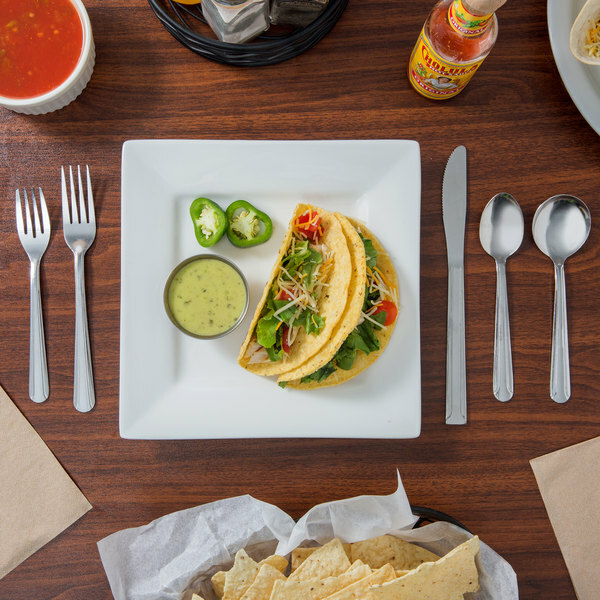 Choice flatware is ideal for daily use in high-volume venues, making it the perfect choice for self-serve, fast-casual restaurants. 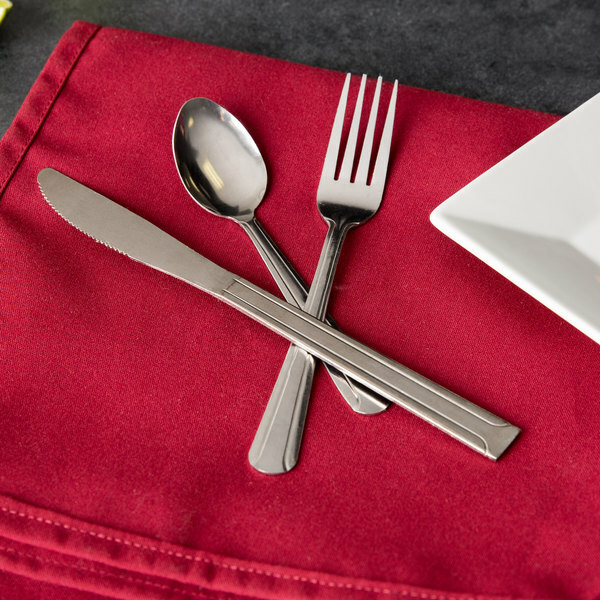 Each piece from Choice's flatware line is designed not only to meet your needs, but to meet the needs of your budget as well. 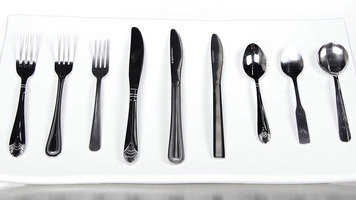 Check out this video to learn what type of flatware is best for your restaurant or establishment! Learn how the weight and material of flatware can help you decide which flatware option is the most economical choice for you. There’s a lot more than price that goes into choosing the right flatware for your restaurant. You will also want to keep things in mind like metal quality and durability, style, weight, and theft and loss. In this video I will go over each aspect of restaurant flatware as well as discuss care of your flatware so you can make your investment last. Most restaurant flatware is stainless steel, and for good reason. It’s durable, cleanable, and corrosion-resistant. Did you know that there are different types of stainless steel, though? The types of stainless steel and flatware is designated using two numbers separated by a back slash. The first number is chromium content percentage. Chromium is what gives stainless its strength and rust-resistance. Most flatware will either have a number 13 or a number 18. The 18% chromium is better quality and will be more rust-resistant. The second number is nickel content. Generally you’ll see numbers like 0 if it has no nickel up to 10 if it has 10% nickel. Nickel not only increases the rust-resistance of the metal, but also gives the metal a warmer, more silver look. 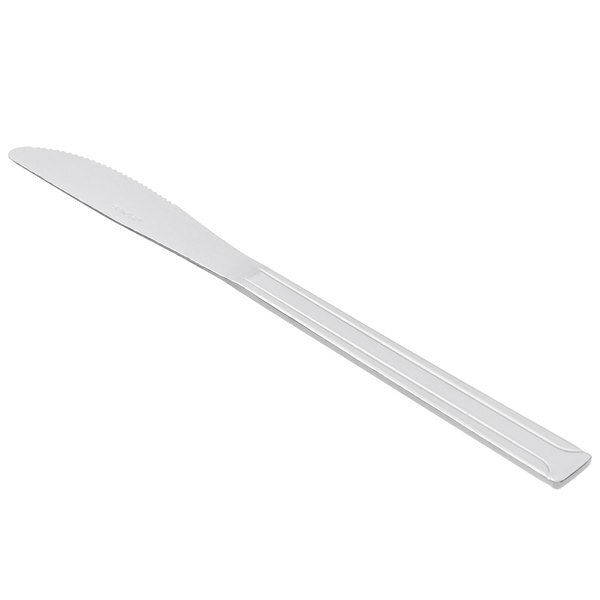 However, if you have a problem with guests or employees throwing out flatware, please note that the nickel makes the flatware non-magnetic, so it will not work in flatware retrievers. Restaurant flatware comes in different weights: medium, heavy, and extra-heavy. Medium weight is sometimes called economy weight, like this Windsor flatware, it is so lightweight that you could fairly easily bend it. It’s often found in hospitals, schools, snack shops, and institutions. It’s a great choice if theft or other loss is an issue. Expect to replace it more often, as it is not generally as corrosion-resistant. Heavy weight flatware is more durable than medium weight and will not bend as easily. It feels better in your hand, and it often has a better finish than the economy and medium weight. It’s perfect for causal and fast casual dining and other mid-level eateries. Extra-heavy weight is our premium grade. It feels very sturdy in your hand, and it is very difficult to bend. This is what you will find in fine dining establishments. To keep your flatware looking good, be sure to follow the proper procedures in cleaning. Just because flatware is stainless steel doesn’t mean it can’t rust. Here’s how to clean your flatware. Stainless steel flatware will last longer and look better if you keep the following tips in mind. Remove all food remnants from your flatware as soon as possible. Sort and handle properly. It’s a good idea to sort the tines, blades, and bowls down if you transport flatware in the same cylinders. When washing in flatware cylinders, it’s a good idea to mix up the flatware so the forks and the spoons don’t nest. And wash with the business end up. Pre-soak for approximately 20 minutes. Noble Chemical Silva Soak pre-soak powder is a great choice for pre-soaking your stainless steel flatware. This concentrated powder, a little goes a long way, penetrates and saturates soils for more effective removal in your wash cycle. And don’t forget to change your soaking solution after a few cycles, otherwise chemicals and food particles will accumulate and reduce its effectiveness. Like all stainless steel, hard water and detergents high in chlorides will eventually break down the protective film. As long as you follow proper pre-soaking and drying procedures, and your dish machine is rinsing correctly, any high-quality detergent or sanitizer should not harm your flatware. To ensure your flatware always looks its best, be sure to polish immediately with a microfiber cloth or mitt, eliminating any water spots or smudges. Thank you for watching and if you have any questions about flatware, please use our Live Chat button. The cheapest silverware on the site, but suprisingly durable. We have a magnet trash can lid so it saves a lot, but we’re always replacing it. I’m surprised they can manufacture it for this price. 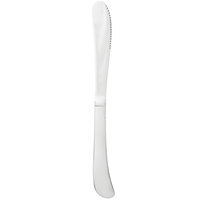 Great price for a simple and durable dinner knife. Seems to hold its shape and cleans well too. Would buy again but don’t feel like I would need to as durable as they seem! We have replaced all our old knifes with this item. It's perfect in company with the fork and knife offered by this company as well. These are perfect if you are just opening a restaurant and need to go fairly cheap with to start. Great product for the price you pay. For an inexpensive knife, this is a great option. We've used these dinner knives for almost 2 years and have had no complaints. Will continue to order. For the price you can’t beat it! The quality of the knife is great with even a cute design on with availability to purchase matching forks! Great product. Doesn’t bend easily and holds up! Highly satisfied and will order again! Thanks! Great product for our daily use in our breakfast cafe. These knives give our set ups a great look and are easy to clean and maintain. You can not go wrong with Dominion brand for your silverware at home or at the restaurant. We purchased these for a wedding reception on our farm. They were actually cheaper to purchase the silverware from Webstaurant than it was to rent them for the reception. Awesome Price! These medium wight dinner knives are actually really sturdy. They don't bend unless maximum pressure is applied. The price is what will sells these knives. These knives are great and very reasonably priced. These are a great option for a party instead of buying so much plastic ware. We will use these and the corresponding forks and spoons year over year. Not intended for heavy duty cutting, and not necessarily pretty, but the serration is enough to get through steaks and anything else at the dinner table. These knives are a very inexpensive option for any restaurant. They are good looking knife for the price. I will definitely order more in the future. Definitely recommend!! Very high quality for the money. I ordered these along with the dinner fork and tea spoon for a large dinner party. They look absolutely beautiful on a linen napkin on top of a plate. Came very fast in shipment and I could't be happier. These do not bend easily. I wouldn't use them to pry anything open because they will bend but for dinner use and normal use these are very sturdy. These aren't fancy dinner ware but for economic silverware these are perfect!!! My new dinner knives arrived today !!! Neatly packed in a tiny box, individually wrapped in plastic sleeves. Perfect for spreading some Nutella ( also from webstaurantstore.com ) on toast, mmmm. Our flatware usually gets thrown away by our customers. 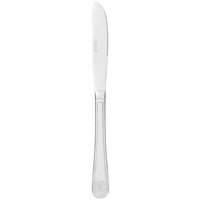 The Choice Dominion 8 3/8" 18/0 Stainless Steel Medium Weight Dinner Knife - 12/Case is a quality product w a great price. This knife is exactly what I needed for a large party. The price and quality are great. I will definitely continue to use them after the party. These knives do the trick and are surprisingly sturdy for being only "medium" weight. They feel great in your hand and are great in our church style kitchen! I like these knives, they are a good weight for the super low price. They get used multiple times and day, and the do not look scratched or bent. Choice dominion 8 3/8 18/0 stainless steel medium weight dinner knife 12/case work great. I like the medium weight better than the lighter knives. Great price. Like the quality on these things. the look is great as well. While they are very easy to clean sometimes you have to really put your elbow in to polish them. I purchased these for a dinner party. The quality was good, and I liked the look of them. But they were lighter in weight than I thought. Live and learn buy heavy weight. Always losing knifes so these are worth the price. They are lightweight and easy to use happy with this product. item arrived quickly and shipped well. These are great quality at a great price. They have a nice design and are a good weight. We will definitely re order these again in the future.